We see them every game, cast in their photogenic stance. Fans love to tear them down. But what is the story behind those fabled goal posts? The information’s pretty tough to find, but I’ll put as much of it together here as I can. In football’s earliest days – and we’re talking Pudge Heffelfinger, pre-1900 days – a field goal was actually more valuable than a touchdown. Under those rules, Stephen Gostkowski’s field goals would notch 5 points, Marshawn Lynch’s TDs only 4. Soon both plays were worth 5 points, and gradually moved to modern-day scoring by 1912. In the NFL’s earliest days — days before the Pittsburgh Steelers and Philadelphia Eagles existed — the league followed the NCAA rule book. Goal posts were on the goal line. When the NCAA moved them to the end zone’s backline in 1927, the NFL followed suit. In 1933, however, the NFL adopted its own rule book and placed the goal posts back on the goal line. NFL goal posts stayed there until 1974, when they were moved to the back of the end zone. Not much happened in terms of design and placement for about 30 years. Perhaps the 30-year gap in development is why goal post history isn’t well documented. The goal posts were basically white, “H” style goal posts made of wood or metal. The goal posts made NFL history at least a couple of times in those years. Goal posts determined the outcome of the 1945 NFL Championship Game, but not in the manner of a missed field goal. The game featured perennial contender Washington against the surprising Cleveland Rams. The Rams hosted the affair, played in sub-zero temperatures (-8 degrees). The quarterback matchup featured the great Sammy Baugh against a breakout rookie, Bob Waterfield. Baugh threw from his own end zone early in the game. He had a wide-open receiver to his left, and that receiver had a blocker in front of him. Cleveland’s defense featured a 12th man, however. The goal posts knocked down Baugh’s pass. By 1945 rules, that counted a safety for the Rams. Baugh suffered an injury after completing only 1 of 6 passes. Frank Filchock took over for the Redskins and threw a 38-yard touchdown pass early in the 2nd quarter to put Washington ahead 7-2. Waterfield countered with a 37-yard strike to give Cleveland a 9-7 halftime lead, the goal post’s safety being the difference. Each team scored a TD in the second half, the Rams extra point failing in the frozen conditions. The Rams won by a 15-14 tally. The number of writers who voted the goal posts MVP is lost to history. The goal posts also factored in the result of the 1965 Western Division Playoff between the Colts and Packers at Lambeau Field. Vince Lombardi signed kicker Don Chandler away from the Giants, ensuring better accuracy than Paul Hornung and Jerry Kramer had provided. Lombardi may have smiled as Chandler lined up to take a last-second attempt to tie the score against the Colts. The kick went well over the 10-foot upright. NFL rules to this day state that if the ball goes OVER the upright, it’s still good. The refs called the kick good, much to the dismay of the Colts. Chandler’s kick looked quite ugly, and had the goal posts been at the back of the end zone like today, the kick would have been at least 6-feet wide. The posts sat on the goal line in those days, and it’s impossible to tell from the film whether the ball crossed over the upright. The Colts were sure it didn’t. The Packers sided with the refs, who always have the final say. The game became the second-ever playoff to go into overtime (after the 1958 NFL Championship), and the Packers prevailed. 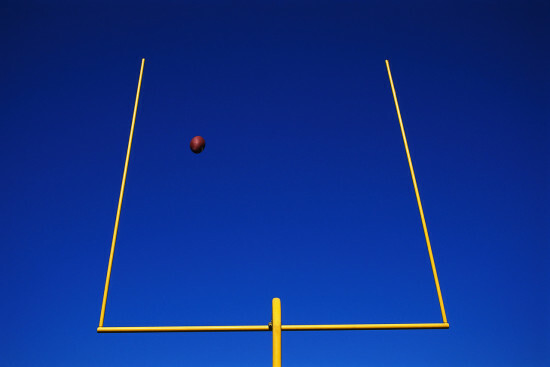 The disputed field goal caused enough controversy that the NFL extended the uprights to 20 feet starting in 1966, and offset them from the goal line a bit. The extention wasn’t much different than what the league did a couple years ago after a disputed Justin Tucker field goal topped the Patriots, and the league extended the uprights to 35 feet. Ever broken the middle prongs out of a plastic fork? Joel Rottman did one day over lunch, and visualized a concept for goal post improvement. Added inspiration came while Rottman drove along the highway and noticed curved street lamps. He designed the now famous “sling-shot” look with a curved base. Rottman, a Florida resident, sold the University of Miami on the idea. The goal posts debuted at the Orange Bowl in September, 1966. The goal posts made their NFL debut in 1967, with all teams bought in. Super Bowl 2 (played at the Orange Bowl in Miami) was the first Super Bowl to sport the new posts. Rottman sold his idea to the Rose Bowl for the 1971 Grandaddy of them All, but with one stipulation. The Rose Bowl didn’t want to spend $1,775 on goal posts only to see them tore down at the end of the game. Rottman guaranteed his goal posts would endure. When jubilant fans spilled onto the field after Jim Plunkett led Stanford to a 27-17 victory over Ohio State, they were in for a big surprise. Rottman coated the goal posts with STP motor oil. Not even the brilliant Stanford kids could figure out ways to topple the slippery goal posts. In 1974, the NFL moved the goal posts from their offset position to the back of the end zone. Although player safety was a concern, much of it was to discourage long-range field goals. In 2015, the league experimented by narrowing the goal posts for the Pro Bowl. No word on whether the narrower goal posts will become standard.